I have come to the turning point of Alexander’s career – the moment when he went from being a successful raider within Persian territory to being the Lord of Asia the Battle of Gaugamela. You coverage of the battle is invaluable but what really took my notice was your reference to the exile of Alexander’s friends (Erigyius, Harpalus, Laomedon, Nearchus, and Ptolemy Lagides), which came about as a result of their part in the Pixodarus affair. These men were recalled from exile after Philip’s death, and raised by Alexander to important offices: Ptolemy was enrolled in the King’s bodyguard; Harpalus, whose health was not good enough for active service, was given control of the treasury, Erigyius the command of the allied cavalry, and his brother Laomedon, who happened to be as fluent in the Persian language as in Greek, was put in charge of prisoners of war. Nearchus was appointed Governor of Lycia and neighbouring territory as far as Mount Taurus. The Pixodarus affair took place in 337 BC (i.e. 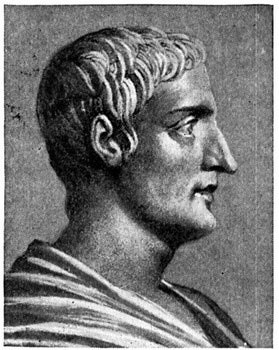 during the consulship of C. Sulpicius Longus and P. Aelius Paetus in Rome); it would be another seven years before Ptolemy became a Somatophylax. I mention this because you seem to imply that he became a bodyguard as a result of his loyalty to Alexander over Pixodarus. If that was true, though, I would have expected Ptolemy to have been promoted much earlier. This makes me wonder why Ptolemy was not promoted for so long? Whatever the reason, it wasn’t because Alexander did not appreciate his friendship. Let us take the example of Harpalus. ‘[S]hortly before the battle of Issus’ he deserted. Was Alexander angry at this insult? No – far from it! The king urged Harpalus to return, and when he did, Alexander ‘restored him to the control of the treasury’. Perhaps Alexander had to keep Harpalus ‘on side’ for a particular reason. Maybe. I don’t know of any, though; until I do, I shall say that Harpalus benefitted from Alexander’s loyalty to his friends. If Harpalus is proof of Alexander’s loyalty, where does this leave Ptolemy? I think he is proof of Alexander’s realism. He was not in the business of promoting his men beyond their ability and / or experience, and that is why the son of Lagus had to wait. I come belatedly to Gaugamela. When considering the matter of war through the eyes of Alexander it is easy (for me) to come away thinking that war is a glorious if unpleasant business. However, your description of the pitched battle between the Macedonians and Persian cavalry disabuses me of that notion. The ensuing struggle was the fiercest of the whole action… breast to breast they hurled themselves on the enemy. Conventional cavalry tactics… were forgotten; it was every man for himself… Desperately and without quarter, blows were given and received, each man fighting for mere survival without any further thought of victory or defeat. I can almost hear the distant echo of horse hooves thundering, men screaming, spears slicing, bodies falling; rivers of blood must have been shed that day – and tears, too – an awful sight to behold. You have written a very sobering passage, which has taught me a great lesson. I am very glad I have never had to experience anything similar. Likewise, I am in awe of those of Alexander’s and my age who have. It’s hard to pinpoint but I am of opinion that he shamelessly glorified himself in his memoirs on which many others based their later books (Arian, Plutarch and somewhat Curtius). Your mentioning of the lateness of Ptolemy’s promotion above reminded me of the whole issue. So, Hephaistion became bodyguard in 333 BC, Leonnatus in 331 BC, Perdiccas in 330 BC and at last Ptolemy in 329 BC. If you look at the commanders at the major battles, at Granicus, Krateros commanded left wing of pezhetairoi and Perdiccas – right wing. Perdiccas also commanded a wing at Issos and Gaugamela. So, Alexander trusted him that much, and I mean military trust; also, remember, Perdiccas is about Alexander’s age whereas Ptolemy considered at least 10 years older. Perdiccas was very impulsive, I think, and it made him more like Alexander; it was reason for his demise in the end, however. Ptolemy reminds me of a spider, rarely venturing out, mostly waiting what will fall into his trap. Patiently, cleverly waiting…. I don’t know, I guess it’s why I don’t like him, I am very impulsive myself. Thank you for that. To be fair to Ptolemy, I don’t think it would have been wise for him to write a fair or objective history. After his arrival in Egypt he was under constant threat from the other successors. He had no choice but to write a history that put him, as it were, at the centre. If he hadn’t he might just as well have given up as satrap or king. It’s fascinating to see when the other men became bodyguards. I am a little surprised that Perdiccas joined so late as he was an important figure much earlier (being a battalion commander at Thebes). Ptolemy joined only a year after Perdiccas but what is really notable is that, as you say, he was Alexander’s senior by nearly ten years. I am open to correction on this, but I don’t think bad soldiers don’t become good soldiers. And they don’t get the satrapy of Egypt when Alexander dies. What arrested Ptolemy’s career advancement for so long? I wish I knew! I love your image of Ptolemy the spider; I think it works perfectly.